Cut cauliflower into florets. Place on a large baking sheet. Drizzle with 1/4 cup olive oil, season with salt and black pepper to taste and gently toss to distribute oil and seasonings. Roast for 15 to 20 minutes or until browned and tender. Meanwhile, heat 2 tablespoons olive oil in a skillet or saute pan over medium heat. Add the breadcrumbs and stir, 2 to 3 minutes or until lightly toasted. Add garlic. Remove from heat. Add chopped Kalamata olives, red pepper flakes, lemon zest and additional salt and black pepper to taste. Stir in parsley. Place cauliflower on a serving platter or shallow bowl. 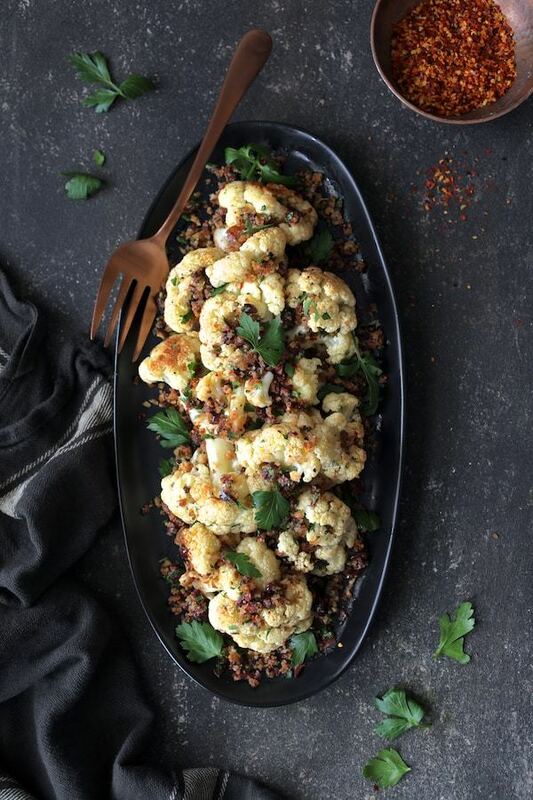 Spoon pangrattato over cauliflower, drizzle with remaining olive oil and serve immediately.